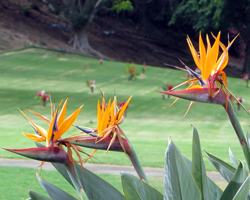 Discover the Punchbowl Crater National Cemetery of the Pacific. 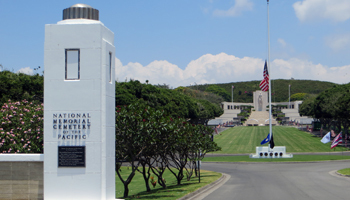 Discover the Punchbowl Crater National Cemetery of the Pacific! 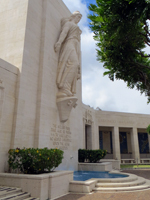 In the heart of Honolulu, Punchbowl crater is a 360-foot extinct tuff cone volcano that shelters and commemorates America’s fallen heroes as the Punchbowl National Cemetery. Visible from almost everywhere in Honolulu, you’d never guess by viewing its overgrown outer slopes at all the scenic beauty and Pacific/Hawaii history that unfolds before you within the crater rim. Punchbowl crater (named for its symmetric bowl-like shape) lies within the volcano called Pouwaina, which in the Hawaiian language can mean Hill of Sacrifice – a translation that closely matches its historic significance. As a result, it draws approximately five million visitors every year – making Punchbowl crater among the most popular Honolulu tourism activities to do in Hawaii! It's also listed on the National Register of Historic Places. Long before World War II, Pouwaina was reportedly used as an altar to offer human sacrifices to the traditional Hawaiian gods. Then during the reign of Kamehameha the Great, a canon battery was constructed on the crater rim. The U.S. military upgraded the crater battery for coastal defense during WWII. Then, shortly after the war ended, Congress approved location for a national war memorial to permanently inter the remains of thousands of U.S. service members temporarily buried on Guam. Parking is available at the sides and back of the monument. 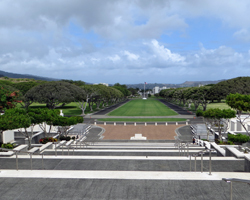 Upon entering the Punchbowl National Memorial Cemetery of the Pacific, you’ll be immediately struck by the awe-inspiring central boulevard crossing entire diameter of the crater up to the monument. Next you’ll see the broad stone stairs flanked by the Court of the missing: 10 marble walls inscribed with the names of almost 29,000 U.S. service members who died in battle and whose remains were never recovered. At the top of the stairs is the Court of Honor, commemorated to all branches of military service and presided over by a 30-foot statue of Lady Columbia. Representative of all grieving mothers, this statue is inscribed with an excerpt from President Abraham Lincoln’s famous letter to Mrs. Lydia Bixby, who lost five sons in the American Civil War. 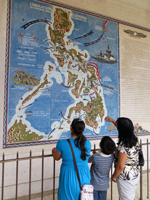 Perhaps the most spectacular sight at the Punchbowl crater war memorial is the gallery of mosaics depicting significant American military battles in the Pacific during WWII and the Korean Conflict. The quality and detail of these military masterpieces is incredible! 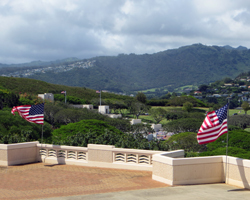 There are nearly 13,000 fallen WWII soldiers buried in Punchbowl Cemetery. Also interred here are the unidentified remains of U.S. servicemen who died fighting in Korea and Vietnam, plus some family members and a handful of others. With the exception of space already reserved for certain living family members of the deceased, this cemetery is full. Pulitzer Prize winning WWII journalist Ernest Taylor “Ernie” Pyle: killed in action covering the war in the Pacific and first person to be buried at Punchbowl cemetery when it opened on July 19, 1949. Sergeant Henry Oliver Hansen: one of the original flag raisers at Iwo Jima. Former Senators Spark Matsunaga and Daniel Inouye: both of 442nd Regimental Combat Team and U.S. Congress fame. Hawaii’s first two astronauts: Ellison Onizuka (who died in the Space Shuttle Challenger tragedy) and Charles Veach. 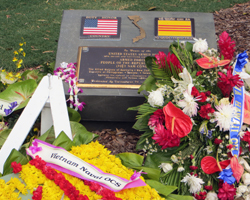 Find a specific grave at Punchbowl crater. Punchbowl crater overlooks most of Oahu’s south side. 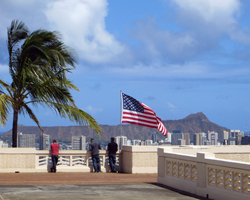 From the vantage of the south rim scenic lookout, you’ll discover breathtaking views of Diamond Head crater, Honolulu International Airport, the Hawaii Capitol district, and the Honolulu commercial/business center! Of all the spectacular Hawaii sightseeing scenic overlooks, this is among the easiest to reach; and yet your negligible effort investment will still be richly rewarded with stunning views of beautiful Honolulu. Once at the crater rim, no matter where you turn, it’s a photographer’s paradise! All views are set against the Pacific Ocean’s brilliant blues or Hawaii’s majestic mountains. So bring a camera, because you’re going to want to remember this!